On Sunday I got my face painted, donned a pair of rather fetching bunny ears, pinned on a fluffy tail ran 3.2 miles at the Woodlands Hospice Bunny Run 2017. Croxteth Park had never looked so utterly stunning, bathed in early Spring sunlight, the hall itself was a hive (or should that be warren?) of activity as fundraisers, runners and tonnes of dogs, came together to support this Woodlands Hospice fundraising event. Roped in by my friend and organiser, Pauline Cox, I signed up to run the 5k course with the lovely Michelle and Kerry and French bulldog Oscar (who completely won the day by being ridiculously cute!). We (just about) got through the warm up with PT Mark Riley before limbering up on the start line. More than 50 runners, old and young turned out to support this amazing cause alongside a team of the most encouraging and smiley volunteers who clapped and cheered every single runner to the finish line. The Lord Mayor of Liverpool, Cllr Roz Gladden handed out medals to all the participants and laden down with Easter eggs and goody bags we set off for ice creams, fair rides and a well earned sit down. If you’d like to get involved with raising much needed funds for Woodlands Hospice, click here to check out what events are coming up. I’ve recently found myself unexpectedly free over August bank holiday weekend after my plans to hit the beach for a few days of paradise were scuppered! Liverpool airport now flies directly to Marrakesh…..dreamy! St Petersberg, Bucharest and Naples just a hop skip and a passport away and there is no way I’m wasting this rare opportunity to do something a bit different! My friend John has not long come back from a mammoth trip to Canada, and Jim is booking flights to Moscow and the Far East with work……and I was looking at interning on a national paper in London for five days before I realised just how accessible Europe is from our very own airport in Speke. I haven’t travelled on my own since I upped sticks and went back to Australia in 2000 at the age of 17. 12,000 miles from Manchester to Paris to Singapore and finally Sydney. Previously I’d gone as far as town on a Saturday! 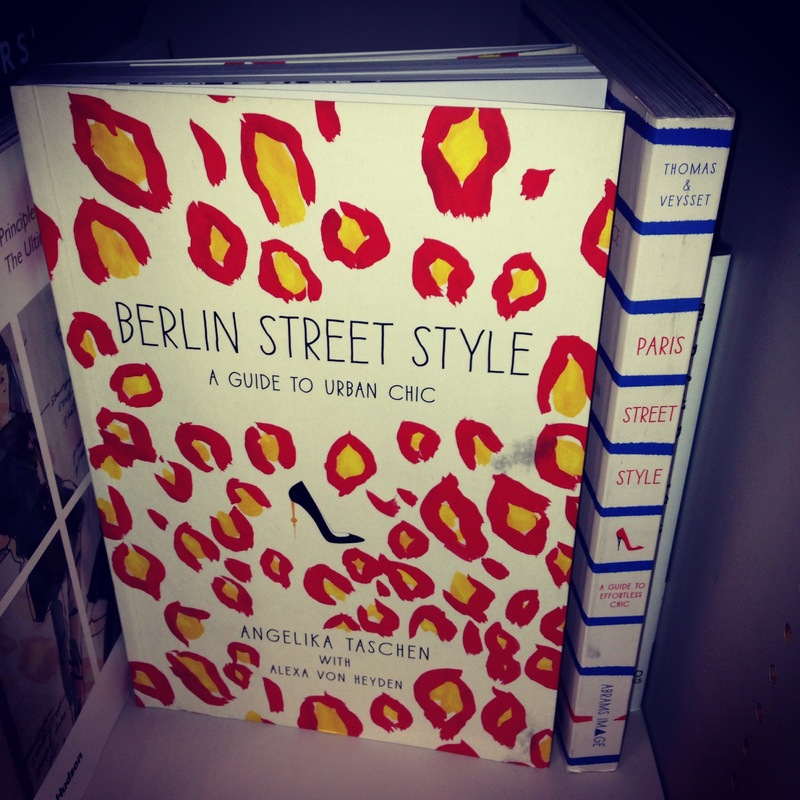 I took to all the style guide books I have at home and thought about having the opportunity to write from my own experience. That was enough to put the wheels in motion. 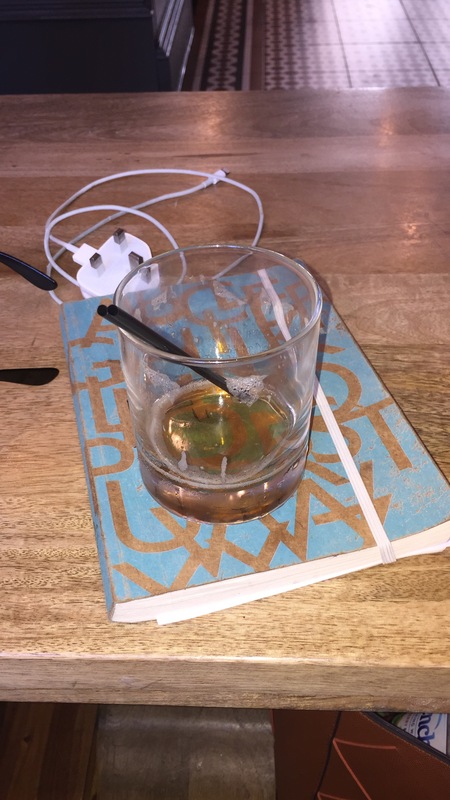 Sat around the table at MacKenzies, Rodney Street earlier this week I voiced my concerns about my little jaunt turning into yet another Taken film (what number is it now…..3…4?) but with promises to come looking for me if I don’t check in regularly (sadly not Liam Neeson) I put those fears to bed as the excitement took over. It goes without saying that ideally I’d love to get the girls together and have a mad weekend city break, laughing til our stomachs hurt and the rose runs out! But the reality of it being the middle of the summer holidays and kids and work and money comes into play! Not so easy to drop everything and catch a last minute flight when you’re a mum! However, determined to not waste this opportunity, I’ve spent hours on Kayak (travel app) looking at flights and inspired by a work event airside at John Lennon Airport this Tuesday, I’ve woken up this morning and just booked a single flight. It’s done, and come hell or high water, it’s going to be an amazing adventure! I’ll get back to you at check in. Morning Campers and a very happy Halloween to you all! It feels like its been the longest week in history, stock piling silly string and sugar skull decorations while randomly doing the dishes wearing a witches hat and those plastic vampire teeth…..all in an attempt to get into the party mood for today. I survived the zombie invasion of Hope Street last night and had so much fun filming with my fellow NCTJ student friends in the process. You can see all my pics here and read my zombie street style article on Purple Revolver later today. So despite almost being run down by shocked drivers, and scaring the living day lights out of theatre goers at the Philharmonic Hall (they’d just seen a special screening of Psycho, and came out to zombie banging on the glass doors shouting brains!!!) I’ve sustained only light latex wounds on my face and a bit of a headache from all the laughing. My favourite part of the night was 5 of us standing in line in a deserted Subway chain only for the guy to come out to serve us and almost die of shock. Face scrubbed clean and slightly less ripped clothing on today, I’m heading to the Girls Day out event at Liverpool’s Exhibition Centre on the waterfront before the face paint comes out AGAIN and its swiftly onto thee Day of The Dead party this evening with Caz! Pics to follow. Struggling to sit at my laptop long enough to type about Halloween as I already want to go mad and decorate the house…..and there’s still a WHOLE WEEK to go! For the first time in forever (yep I just belted that out in the silence of my kitchen in my best Idina Menzel voice) I am going to be child free on Halloween…..and to celebrate this rare and momentous occasion I am attending some seriously awesome Halloween festivities! First off I’m not completely shirking my parental responsibility, seeing as its half term I’ve booked some spooky treats for my little people too. We’re off to the Little School of Horrors, Gostins Building Liverpool on Tuesday with the eldest dude to partake in some special effects make-up work shops aimed at 8-11 year olds. Staff at the school have worked on shows such as Dr Who, Sherlock and Monroe, so I’m expecting my girl will have a blast. I’ll stick the pictures up afterwards and if you want to book on too you can find out more about their half-term sessions here. As the Little School of Horrors sessions are aimed at older kids, I had to even it out and accommodate my little ones too. So, Wednesday and Thursday is drop-in-tastic at Make Time Studio West Derby with a whole host of ghoulish craft treats to create. Kate who runs the studio is just brilliant with younger kids too, getting everyone involved so we’re super excited to bring home some hand made trick or treat bags and masks. Sessions are from 11-4 and £5 per head. Find out more here. Hopefully the kids will be worn out by Thursday afternoon…as on Friday things take a seriously creepy turn. 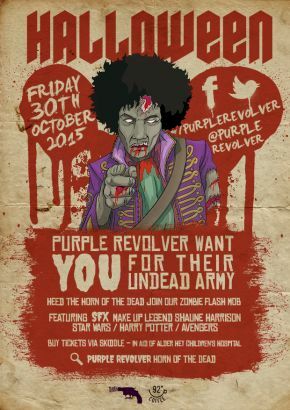 If you’re at a loose end, over the age of 6……and fancy being in a Zombie movie…..head on over to 92 Degrees Coffee (on the corner of Hope Street & Hardman Street) and prepare to be part of a Zombie Flash Mob with Liverpool based company, Purple Revolver. 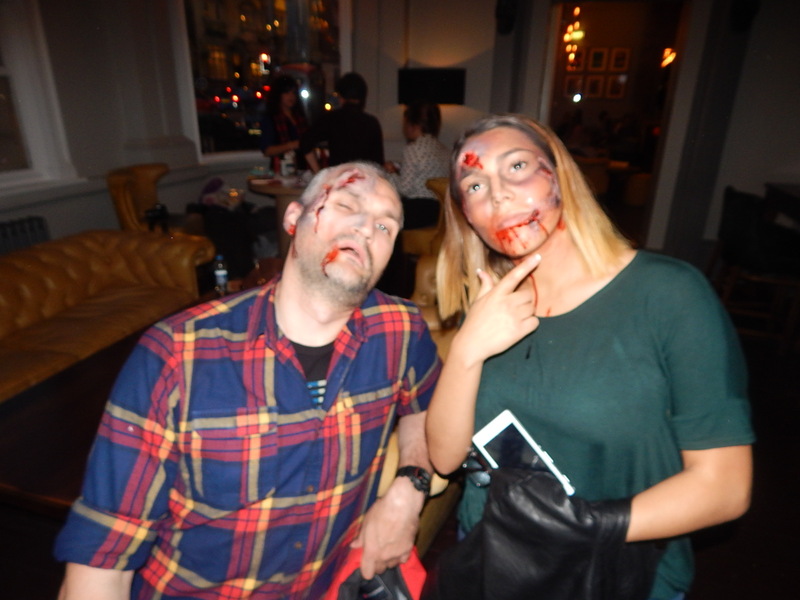 The Horn of The Dead event aims to gather 100 real-life biters to be filmed on Hope Street for Bay TV, and with SFX make up legend Shaune Harrison overseeing the make-overs….you just know its going to be hellish! Having worked on Avengers, Harry Potter and Star Wars, Shaune and his team are going to transform Hope Street into a living nightmare. If you’d like to get involved tickets are £5 and proceeds go to The Alder Hey Charity. Timings and stuff here. Finally, on to the main event. Making the most of child-free-ness was always going to involve alcohol however because I’m on parr with Monica from Friends when it comes to party planning I’ve spent an age trawling websites to source the best quality decorations. This year me and Caz have opted for a The Day of The Dead theme with Mexican sugar skulls and flowers. Luckily for us, North West based, online party supplier, Party Delights have a HUGE amount of affordable Day of The Dead items, from table wear to full adult costumes and photo booth backdrops (some items are as little as 89p….I may have a gone a bit overboard) I managed to order everything we needed in one fell swoop and delivery was ridiculously quick. The only issue is not being able to break open the packaging and get the party going! I’ll post some pics of our goodies during the week because there’s no way I’m not opening that box until Saturday! 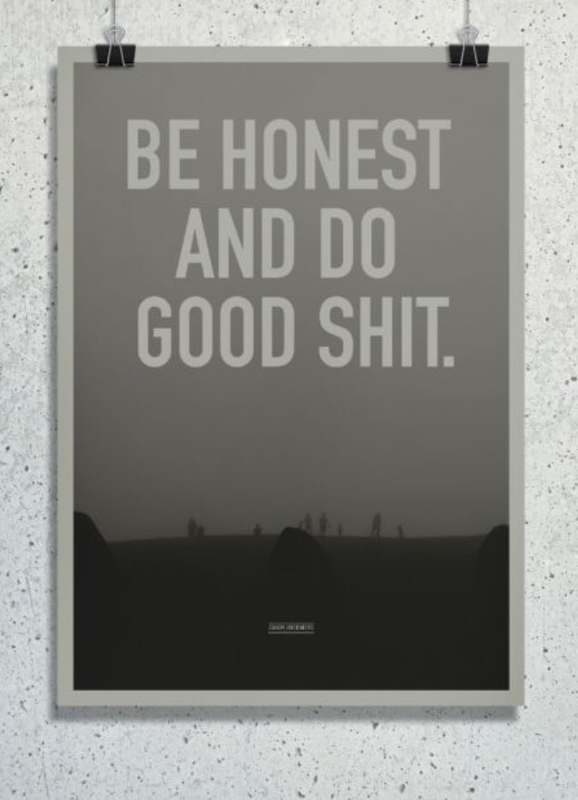 Guys and girls of the world wide interweb…I need your help. No…no…I don’t want money….nor do I want to take up your spare time to wash cars, bake cakes or sell raffle tickets…..but I do want your old clothes….or rather the lovely people at Wex and Golden Square Coffee on Wood Street, Liverpool do for their charity clothing drive and sale. I would love to see you on Friday 24th July from 7pm with a big ol’ bag of great quality unwanted men’s or women’s clothing of any size. 100% of the profits are going to Liverpool‘s leading homeless and housing charity,The Whitechapel Centre, and what they cant sell online they will donate to their charity shop…which opens soon. The Whitechapel Centre do a phenomenal job helping those in need of support in our great city. From their open access center offering showers, laundry services and breakfast to a safe place to sleep and ongoing housing support. The center have posted on their Facebook page asking for any good quality shirts and suits that might just give someone the confidence they need to attend an interview…and get the ball rolling towards a brighter future. So, whats that you say?…..Summer holidays….no baby sitter…..girls night out……date night with your bae……no bother at all. If you have a pair of jeans, any sports wear, shirts, suits basically anything with plenty of wear left in it….any size….drop me a line and I’ll come and collect it. It takes as much effort as making a cuppa to have a quick rifle through your wardrobe and fire me a quick email or whatsapp to arrange collection (Within the Liverpool area only) Minimal effort….maximum effect! Also, if Friday is date night and you’ve not yet made plans, swing by Golden Square Coffee, pull up a pew, soak up the atmosphere, live music, DJ’s and craft beers…right in the heart of the city center…. or if you love vintage fashion, one of a kind garments or simply a bargain…come take a look…..I’ll see you there. If you’d like to know more about any of the organisations involved click here. Thanks in advance you lovely lot!